How do you like your goodness, mate: deep-fried or sugary? Aside from their banality, clichés such as “hidden gem” and “best-kept secret,” are nonsensical descriptors. Unless you’re the sole customer on opening day, someone knows about that restaurant. In Taipei where almost every dank back-alley eatery has been blogged, there are no secrets. But there still are places that get little, if any, press. The Indonesian food street that comes to life each weekend on Beiping West Road (北平西路), close to Taipei Main Station, is one of these. Segregated from the clamor of the main drag by railings, steps and a line of trees, it’s literally in the shadows in the Taiming Li neighborhood (泰明里) of Zhongzheng District (中正區). Around the corner in an alley off Zhongxiao West Rd. (忠孝西路), there’s Sinar Terang, a small restaurant that is slightly better-known, though outside my single-digit coterie of familiars, I’ve yet to see any Westerners there in the four or five years I’ve been going. Remarkably, I’ve come across only one, rather bewildered-looking, Taiwanese couple in all that time, too. On weekends at the Beiping location, you might fancy yourself in downtown Jakarta – as groups of young Indonesians squat around the low walls, sipping sweet tamarind juice, the young men puffing clouds of clove cigarette smoke into the late-afternoon fug. Look carefully and you might spot a craftily positioned bottle of Scotch at the feet of these young Muslim men. 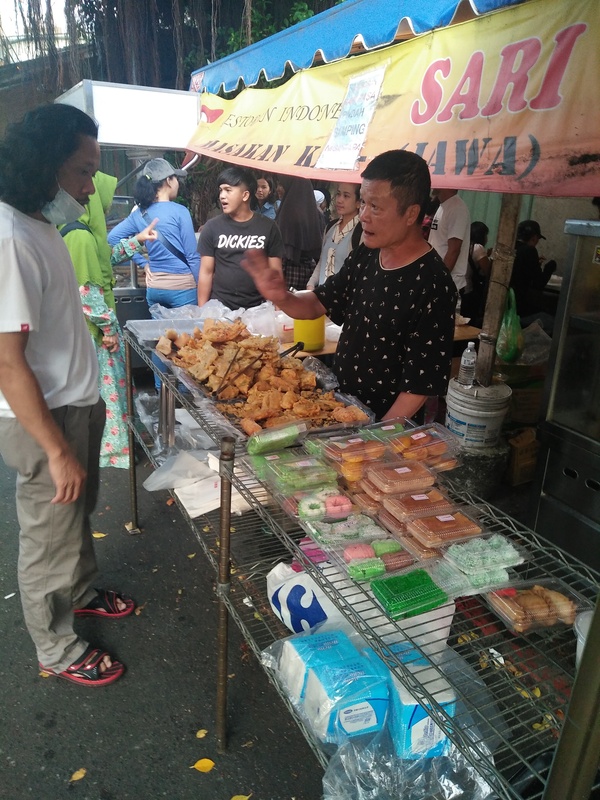 Opposite, vendors hawk “bakwan” – vegetable fritters – and sweets such as “kue klepon,” a liquid explosion of palm sugar encapsulated in a coconut-flecked rice ball. From inside one of the restaurants, the latest bahasa pop hits reverberate on dodgy karaoke mics, competing with the rasping of the minahs in the foliage overhead. As of 2016, there were around 238,000 Indonesian migrant workers in Taiwan, making them the biggest group of foreign residents by some way. You will find people of Chinese descent, here, to be sure, but most of them are from Indonesia’s two-million-plus “huaqiao (華僑)” community, Indonesian born and bred. Those who aren’t have ties of some sort to the world’s largest archipelago. The restaurant started life more than a decade ago as part of a food court called Golden Square, which was located on the second floor of Taipei Main Station. “Back then it was a real mess,” he says. “Not nice and new like it is now.” You can see his point. Exuding department store sheen, the current food court is now part of the Breeze Center. Taipei has cleaned up her act. Ramshackle canteens are no kind of first impression to offer tourists. Mr Jian prepping some food. His wife Akiu (陳亞玖) certainly has a youthfulness about her. Having grown up in Sumatra, she speaks heavily accented Mandarin. Like quite a few Chinese-Indonesians in Taiwan, she is Hakka and considers this her mother tongue. As she assists at the stalls out front, she switches to Bahasa to address her employees. 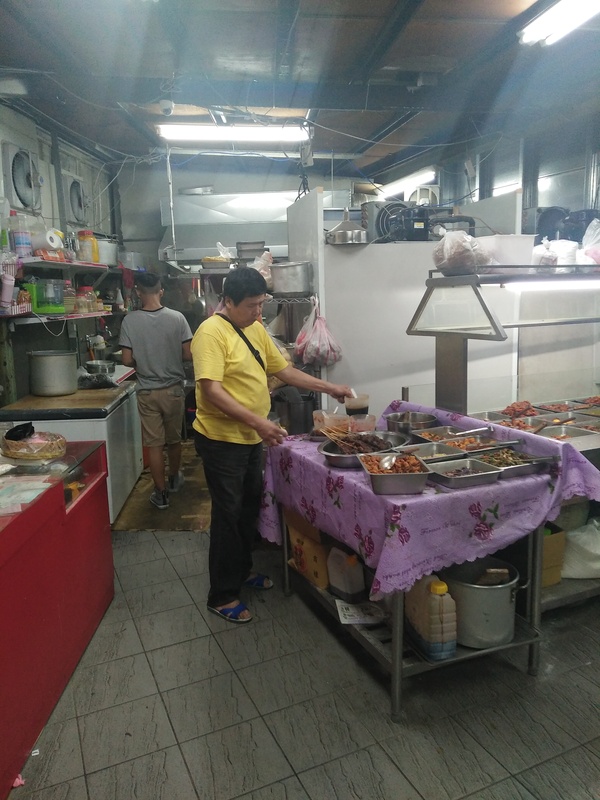 The couple also run a place on Guangfu Rd (光復路), near Taichung Station and close to a network of lanes that is filled with restaurants and stalls offering Southeast Asian food. I’m curious as to why Taipei has nothing similar. There’s the Filipino enclave in Zhongshan District (中山區), but nothing with the scale and variety of the Taichung area. No one seems to have an answer. “Everything is split up here,” says Jian, begging what’s in question. All of the restaurants in the area are buffet-type affairs. With occasional variations, they serve up familiar Indonesian staples. There are usually several types of tempeh on offer, accompanied by vegetables, chilis, dried fish and various spices. This fermented soybean cake is thought to be the only traditional soy-based food not to have originated in China. For vegetarians, it’s a cheap, adaptable source of protein. Mr. Jian sells chunky packets for NT$50. Mutton, beef and tripe curries feature, as do different types of dry, heavily spiced innards – liver, gizzards and other odds and ends. 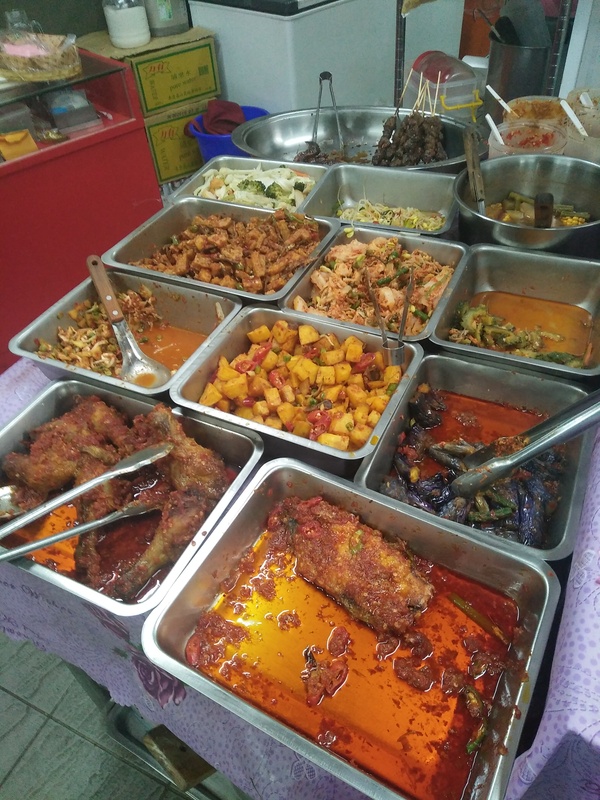 There is usually at least one kind of fried fish in sambal – Indonesia’s hot sauce of choice – and stewed, curried vegetables such as cassava leaves and jackfruit. 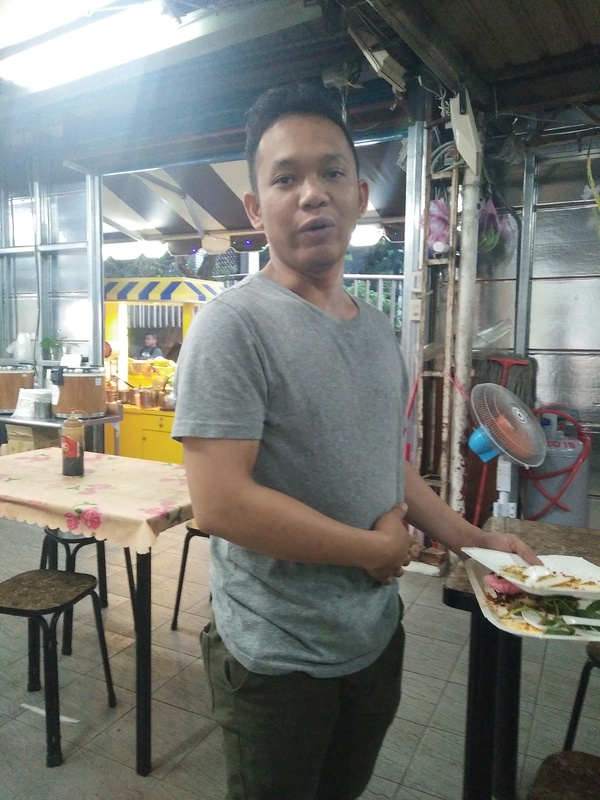 Roy is lumped with talking me through the mystery dishes – “pecel” and “karedok,” two Javanese spicy salads that are similar to “gado-gado,” though the “karedok” uses raw veg and grated coconut. Both are tasty and are bursting with flavor. Roy might be majoring in public health, but I wouldn’t go expecting exemplary hygiene at any of the shacks on the alley – just good grub. A 21-year-old scholarship student, Roy is about to graduate from Taiwan Medical University with a master’s in public health. He has applied for a PhD program at Newcastle in the U.K., but thinks it’s more likely that he will continue his studies here in Taipei. “My scholarship is actually enough to cover my tuition and my living expenses,” he says. “I work here so I can save some money to […]” He smiles sheepishly as he weighs up his words. “To send money back home?” I offer. At the new Mirasa – the one that got to keep the sign – a pair of towering young men man the stall out front. The term “gorengan” refer to all kinds of fritters but the main constituents here are corn, soybean and assorted bits of veg. Born to a Taiwanese father who had business ties in Indonesia and a Chinese-Indonesian mother, Yu Li-nian (俞立年) and younger brother Yu Rui-nian (俞睿年) offer an insight on to the lack of local custom here. 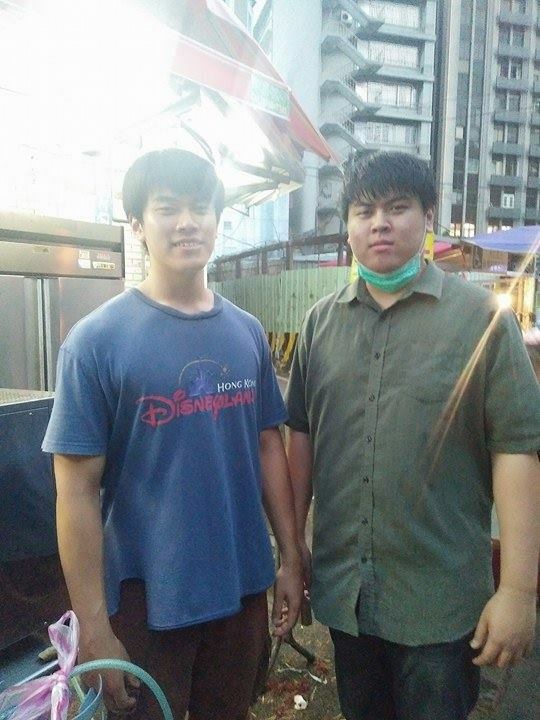 The Bros Yu, Li-nian (俞立年), left, and Rui-nian (俞睿年).